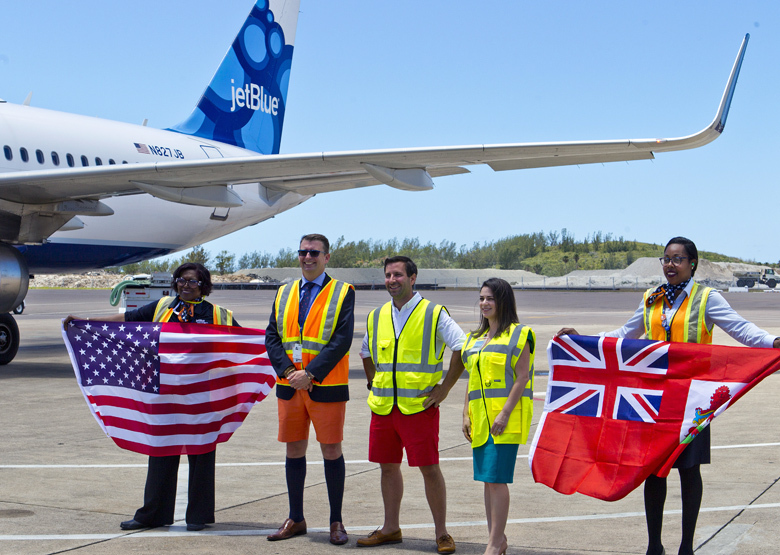 Officials were on hand today [May 18] to welcome the Jet Blue flight from Boston, which marks the beginning of a year round service between Boston and Bermuda, which for the past ten years has been seasonal. Speaking at the airport today, Minister of Tourism, Transport & Municipalities Michael Fahy said, “Good afternoon Ms Cortes, colleagues from Skyport, the BTA and of course of course the rest of the Jet Blue family. Welcome to Bermuda on a truly magnificent day! “I am honored to be here to welcome this Jet Blue flight from Boston. This marks the beginning of a year round service between Boston and Bermuda which for the past ten years has been seasonal. 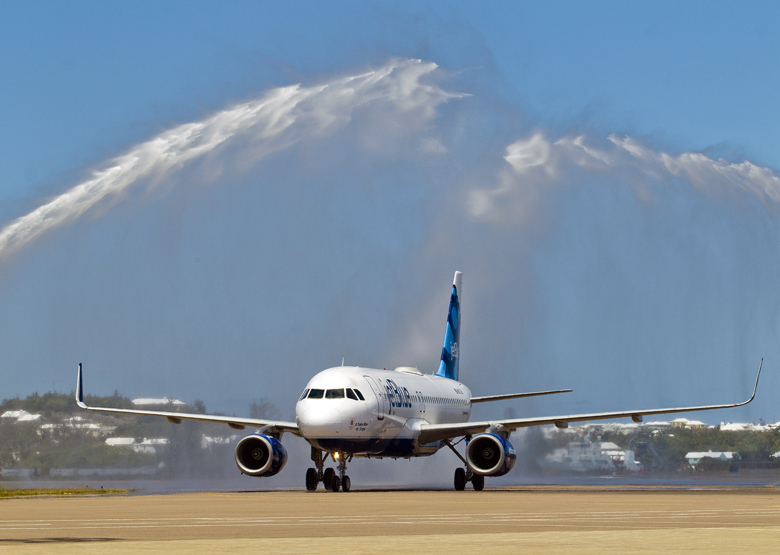 “Over the past few years, following the success and popularity of the Boston-Bermuda flight, JetBlue has made incremental additions to their flight schedule for this route…starting the season a week earlier and pushing back the end of the season by a week or two, each year. 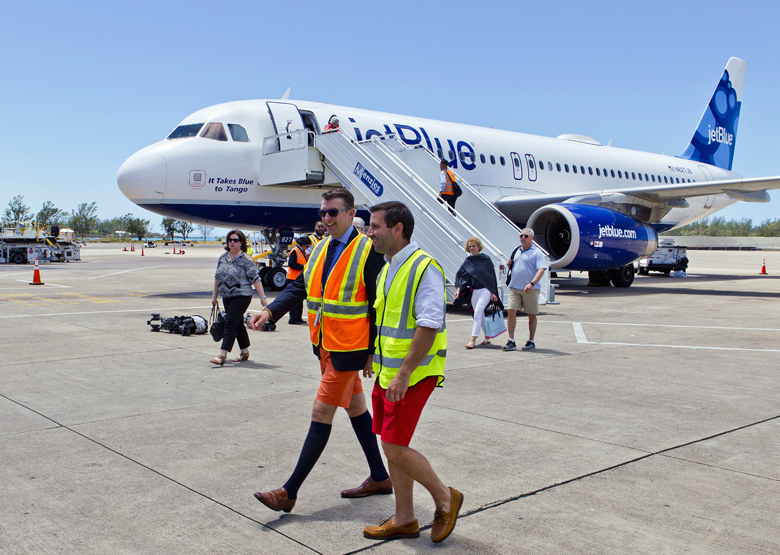 “Today, however, represents the biggest development in our joined history since Jet Blue began flying to Bermuda and it is fitting that as Bermuda continues to grow as a visitor destination, JetBlue will grow with us. 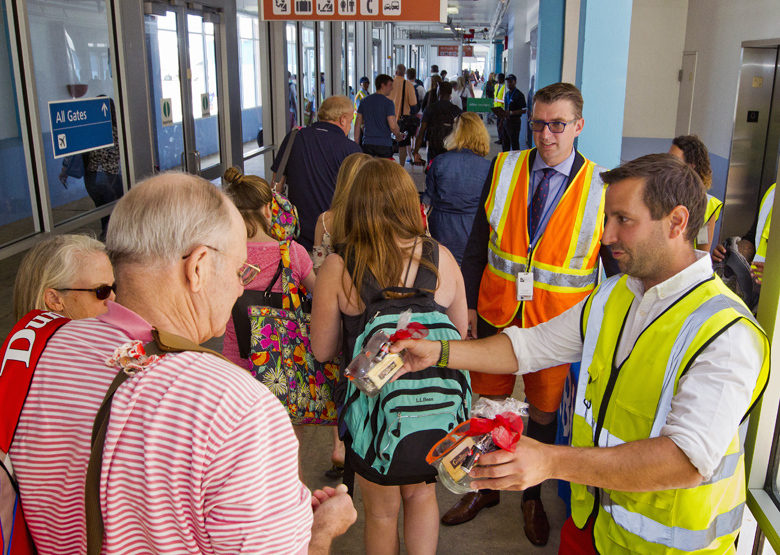 “Out of JFK, we now have two daily flights operating to Bermuda through the summer – that means twice as many opportunities to travel our way. One of those flights will continue operating post-October and keep flying through the winter. 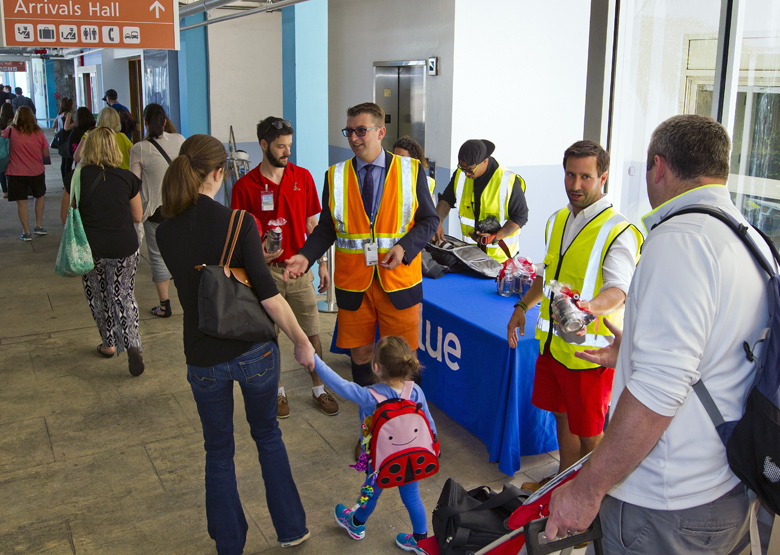 “Beginning today, out of Boston, the JetBlue experience never ends. 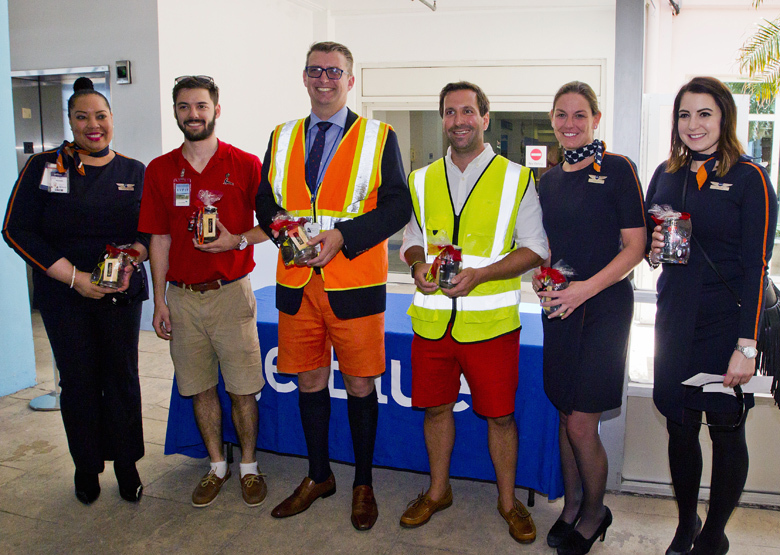 JetBlue will now fly between Boston and Bermuda every month of the year and we’re delighted about doing our part to save New Englanders from the harshness of their winter. 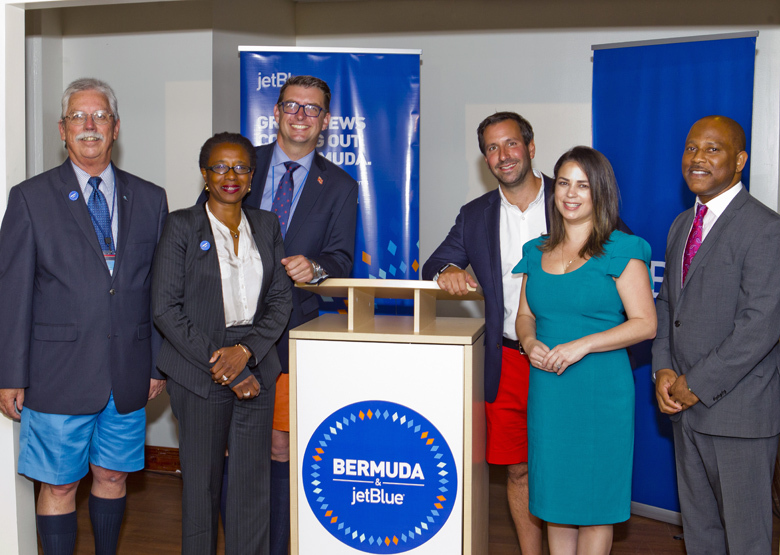 “This partnership with Jet Blue is yet another indication of the return of confidence in Bermuda as a tourism destination and is a result of a hard work of the Ministry, the Department of Airport Operations – now Skyport – which is headed by Aaron Adderley, and of course the outstanding market efforts led by the BTA over the last few years. “Increasing air arrival numbers speak for themselves and I am confident that things will only continue to get better and that we are truly in a renaissance period for Bermuda’s tourism product. “The partnership between the Ministry, Skyport, BTA and or friends at Jet Blue will ensure that my confidence is well placed. Well done BTA and the OBA.i am getting used to the good news daily. as a regular visitor from Boston this is great to hear! That’s a good start. But how about creating competition on the Florida route. Nothing has been done to prevent the American Airlines gouging on the BDA-Miami route. Since Jet Blue seems to be willing to open up more routes, how about having them reinstate the Fort Lauderdale-Bermuda route. We had it few years back and it mysteriously disappeared under PLP (underhanded deal anyone???). Let’s take care of Bermudians who love to travel to Florida and South America by creating some competition to AA! A Orlando,Florida to Bermuda route should be considered. There are no direct flights . Do we get the airlift out of the Florida market to make another Florida flight (either Miami, Ft Lauderdale, Tampa or Orlando) feasible? At one point we got AirTran to provide some competition on the Atlanta route but it didn’t last too long. Slow down you bies. Give people time for there next negative comment. I Would love to see Jet Blue fly out of Bermuda nonstop to Atlanta! 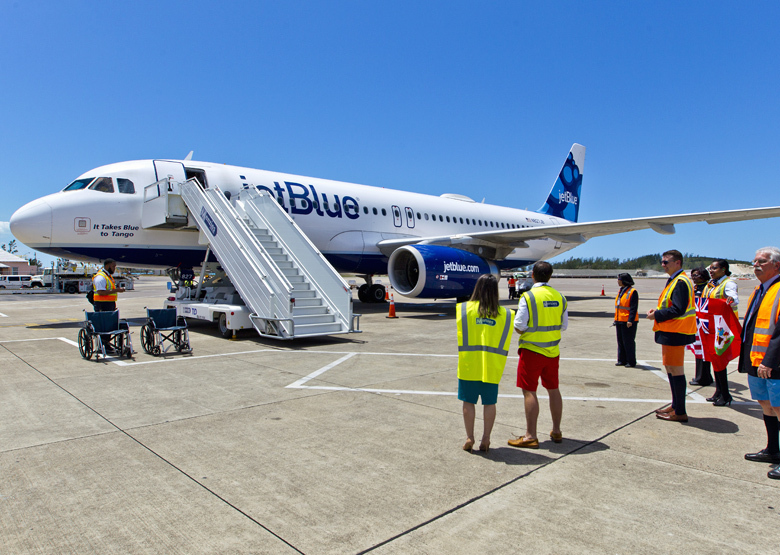 This is great news for Bermudians and the Portuguese traveling to Azores ,not only is the waiting time for the connecting flight cut short ,as I understand the bags are now checked right to Ponta Delgada great ,now if we could get our drivers license to drive in the Azores would be even greater…….thanks jet blue…. A evening flight from/to JFK would be awesome. Would open up travel on redeye long haul flights for earlier arrival times to US west coast cities, middle east destinations such as Dubai, Qatar, Egypt and beyond. Omg! More good news!! What to do? And the great news keeps coming! What an amazing time for Bermuda! So do you see an enormous amount of visitors from Florida who want to vacation here? It’s not always about American coming to Bermuda. Some go down the islands and South and Central American.